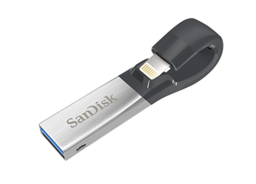 The iXpand Flash Drive includes a one-year limited warranty in the United States. It's available in 16GB, 32GB, 64GB, and 128GB capacities, with MSRPs of $49.99, $69.99, $89.99 and $129.99, respectively. The drive is compatible with iPhone 6s, iPhone 6s Plus, iPhone 6, iPhone 6 Plus, iPhone 5s, iPhone 5c, iPhone 5, iPad Pro (12.9-inch), iPad Air 2, iPad Air, iPad mini 4, iPad mini 3, iPad mini 2, iPad mini and iPod touch (5th generation) running iOS 8.2 or later. The Clarity and Structure tools in Capture One Pro allow you to adjust both fine and coarse detail in your images. There are different algorithms to choose from, so you can use "Natural" for portraits and "Neutral" for objects. And because the sliders are centered positioned, you can both increase and decrease the effect, depending on your subject. In this training video, I show you how to use Clarity and Structure for both objects and for portraits. I review the different modes so you can see exactly how to get the effect you want for your images. 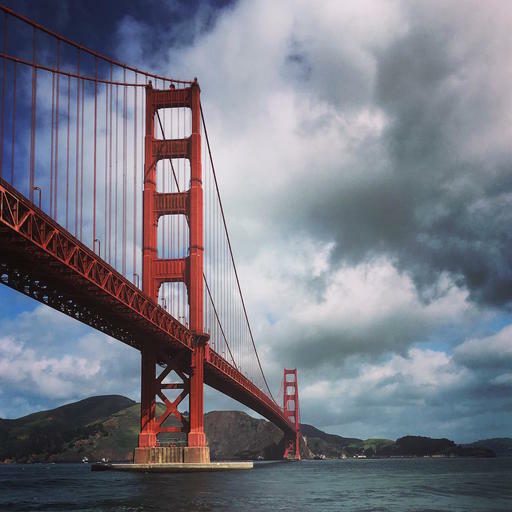 Participants in the TDS SF Street Photography Workshop logged many miles over the course of 3 days. On Friday alone, we worked from North Beach all the way up to Fort Point. Many of the shooters commented that they had walked 10 miles by the end of the day. Fortunately, we were using street-savvy Lowepro bags to protect and transport our gear. Some of the photographers used the new Slingshot Edge 150 AW ($64), a sling that can hold a mirrorless body and a couple of lenses. Plus, a mini tablet will fit in a zippered front pocket. Interior areas and the adjustable divider system organized and protected their cameras and lenses, while smaller accessories were stored in the front. The Edge helped keep the load from getting too heavy, yet protected the gear our shooters needed. Participants who wanted to have a bit more kit used the larger Lowepro backpacks. These were particularly handy for larger DSLRs and their more bulky lenses. I was relying on one of my favorite urban bags, the StreetLine SH 140 that I had fallen in love with during an assignment in Austin, Texas. I had my Olympus OM-D E-M5 Mark II and Contax G1 cameras in the StreetLine, along with an iPad and personal items for the day. I could work quickly out of the sling, and it never tired my shoulders, even over the course of climbing hills and exploring the streets of the city. I think one of the keys to both our survival, and our ability to record hundreds of images over the course of three days, was having properly packed bags that allowed us to bring what we needed, but didn't add too much bulk as we navigated busy urban environments. If you want to learn more about finding the right carrying solution for your adventures, jump over to lowepro.com for a look-see. We spent the mid part of Saturday in Sausalito for the TDS SF Workshop. The weather was beautiful for tourists, but not ideal for photographers. So what do you do when you want to take pictures in harsh, contrasty conditions? I have three tricks to recommend. First, fill flash can help offset nasty shadows for portraits. If you have an off-camera cord or wireless communication, you can even position the fill light at exactly the right angle. I think shooting infrared is also a terrific option. It thrives in contrasty lighting. And the one that I'm going to show you now is using a built-in camera effect. In this case I'm using the Key Line Art Filter on my Olympus OM-D. I saw a watercolor greeting card in one of the shops, and thought, "I can do something like that right now!" I capture these in RAW+Jpeg, so I have the "regular" images too without the effects. For the Jpegs, I use the Large/SuperFine setting to get as many pixels as possible. And with photos like this, you can make your own fine art greeting cards. You can get the scored blank cards, envelopes, and everything else at Red River Paper's Card Shop. So, on a bright sunny day, I put on my sun block and keep taking pictures. I could care less about harsh light. Like any photographic subject, the more angles you explore, the more variety of shots you can capture. 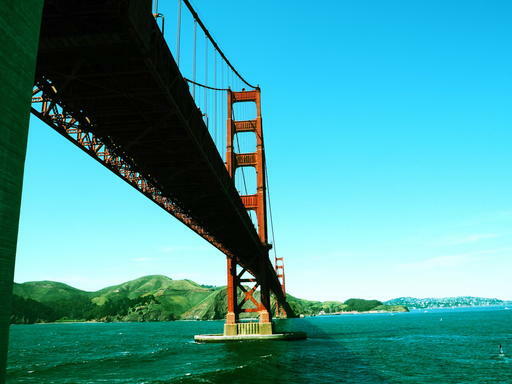 This becomes particularly important with mature subjects, such as the Golden Gate Bridge, that is photographed hundreds of times a day. 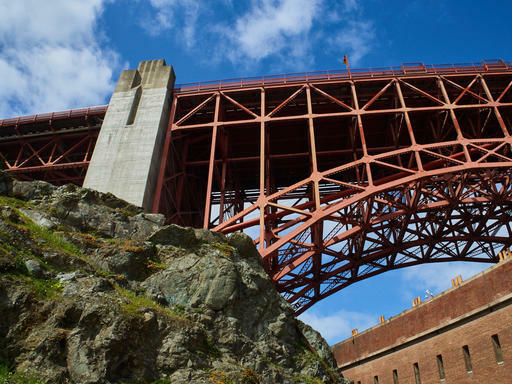 During the TDS SF Street Shooting Workshop, we went under the bridge for a different perspective. Here are a few of the images. In addition to playing with different perspectives, also consider working with different filters and exposures. For example, two of these shots were made using Art Filters on an Olympus OM-D mirrorless camera. I shoot RAW+Jpeg, so even with the filtered shots, I have a straight RAW version that I can work with in my photo management app. Many of us have mature subjects in our worlds. Revisit one and explore how you can create fresh images from an old friend. Recently, David Grover, business support for Phase One, and myself got together for a conversation about moving from Aperture to Capture One Pro. This falls into line with my thinking that C1 is the logical transition from Aperture for professional and demanding enthusiast photographers. Similarities between the two photo management applications. Differences and things I miss from Aperture. New tools in C1 that I wish I had had in Aperture. Tips for new Capture One users. 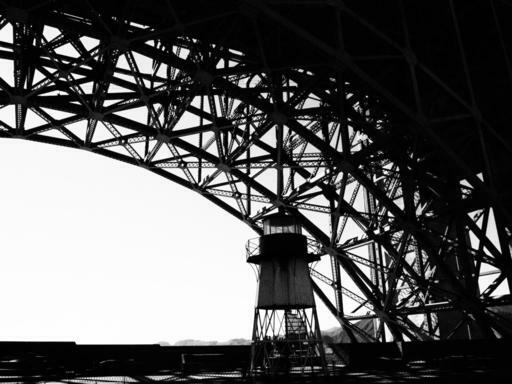 Resources for making the move from Aperture to Capture One. If you're interested in these topics, you might want to spend your lunch break with us. It's a good conversation that I hope you'll find helpful. Why would you care about theAnalogstory.com? After all, you're perfectly happy with your digital camera. Or are you? Have you had the sense that your images are all starting to look the same? Or that maybe you've lost your artistic edge as a photographer? I know I was feeling that. So back in December 2015, I took the challenge to start shooting film to see if that approach would elevate the entire body of my work. And it did. And I began to notice the changes quickly. I'm not an extremist who advocates that you flush your iPhone down the toilet and ditch your digital on craigslist. In fact, just the opposite. I believe that the integration of analog photography with digital workflows completes us. We now, literally, can choose the right tool for the project at hand. I have never been happier as a photographer as I am now. I depend on my nimble mirrorless kit to help me publish online and satisfy clients' needs. My iPhone is an invaluable tool that records metadata for the analog shots, and quickly captures and shares images with others. I will never give up my digital cameras. But exploring life with a film camera in hand on Sunday morning walks, bike rides, and strolls downtown has added an element of excitement and creativity to my work. I feel like a real photographer again. I'm approaching my images in a more thoughtful way. And I love working the controls on the camera. I believe that the integration of analog and digital photography is the next big step. And I want to do everything that I can to share that journey with you. 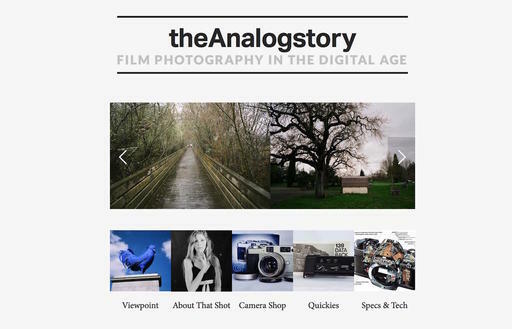 Come by and browse theAnalogstory.com. We have viewpoints and images from film shooters, quickie tips, spec sheets, a Camera Shop, and links to related articles throughout the Web. And if you have a passion for film, share your story with our audience. Send your post (approx. 500 words or less) with up to 6 images to theAnalogstory@gmail.com, and I'll read it. I promise. And if you want to see what others have shared, take a look at the Viewpoint section of the site. 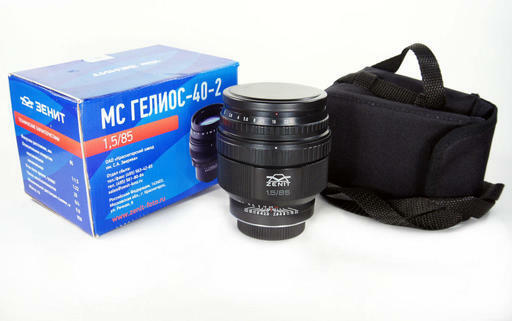 I was just reading an Fstoppers review titled, The Funky Bokeh King: the Zenit Helios 40-2 85mm f/1.5. After looking at the pictures that the author created with the optic, I started thinking about exotic glass again. Fstoppers tests the Zenit Helios 40-2 85mm f/1.5. We've seen similar offerings from Lensbaby, Lomography, and others, so clearly there's some interest in this category. Why? My theory is that digital photography has become so precise, so perfect, that visual artists are craving something different. In part, this has fueled the renewed interest in film. But another way to go is to adapt old lens designs to your modern digital camera. You probably have a few candidates in your closet right now. And there certainly are a plethora of inexpensive adapters on the market to mount just about any hunk of glass to any mirrorless or DSLR. So if you're starting to feel that your images are all looking the same, think about an old lens... Then see what you can create.